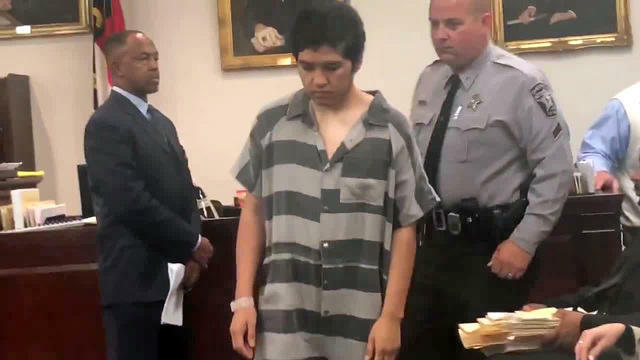 LOUISBURG, N.C. — A North Carolina man accused of decapitating his mother was found not guilty of murder because of insanity. A Franklin County judge found Monday that psychosis drove Oliver Funes Machada to commit the March 2017 killing. Machada, 20, was ordered to remain in the custody of a state mental hospital. Doctors determined Machada had a condition similar to schizophrenia during the killing. Court documents say he told a 911 dispatcher he repeatedly stabbed his mother and a deputy saw him carry the woman's head outside their Zebulon home. Dr. George Corvin, a forensic psychiatrist, testified that Machada heard what he believed was the voice of God ordering him to kill his mother and send her home to heaven, CBS affiliate WNCN-TV reports. Corvin said Machada told him he was happy afterward and that Jesus had given him his angel wings because of what he had done, WNCN-TV reports. "When I first saw him, he admitted that he was hearing a voice telling him that he should kill me and then a voice warning him that the correctional officer that was guarding us was going to shoot me, so you could imagine how tormenting it would be to constantly be exposed to that sort of an experience," Corvin said in court. Machada, whose last name is listed in some records as Machado, was ruled incompetent last year to proceed in court, but a doctor testified Monday his condition had improved enough to finish the case. Machada said little in court but told the judge he understood the proceeding. He also apologized to his family.